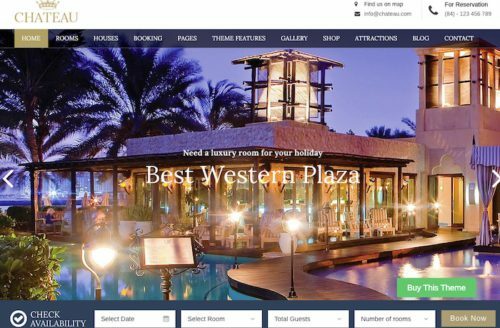 Do you need to create a website for a hotel? This is a collection of WordPress and Joomla Templates specifically for hotels, ski resorts, golf resorts, motels, guest houses, vacation rentals, lodges, and other accommodation websites. If you want to build a website like the Hilton, Marriot, Ritz Carlton, these premium Themes will allow you to create a professional hotel website very easily. The themes below have been designed to showcase your hotel. Some hotel themes have online booking and reservation tools which visitors can making online booking for rooms. These are especially helpful and a great tool to provide. Included in the themes is functionality to showcase rooms, photo galleries, pages for deals, contact information, travel details and more. These are great to create your own premium hotel business website with business WordPress Themes and business portfolio Websites. This is a dynamic list that is updated all the time with new themes as are released. Be sure to bookmark and check back again. If you know of any other hotel and accommodation WordPress themes we have missed, please let us know in the comments.See the Best Hotel Theme Collection Below. 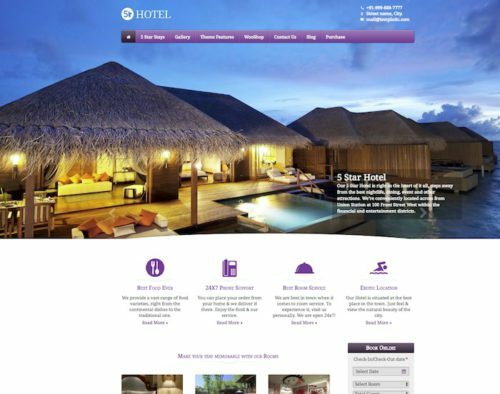 Click here to see more Hotel WordPress Themes. Create a hotel site like the Hilton or Marriott Hotels. Your hotel website will look professional and allow guests to book a room with ease. Showcase your hotel’s best features and nearby attractions. Fill your site with pictures of your resort and glamour. 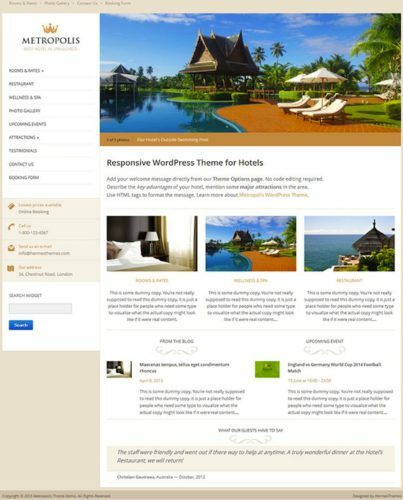 Create a hotel site with WordPress. Below are some WordPress Themes that will help you create your own hotel site. This theme includes external booking service integration, complete color control, video slider support, custom widgets, flex header and footer options, and much more. Andros is a beautiful, responsive Hotel WordPress theme specifically designed to showcase your hotel or resort in style. Enjoy your stay. Milos is a responsive premium WordPress theme suitable for hotels, hostels, apartment rentals or any other accommodation related business. This theme includes external booking service integration, complete color control, video slider support, custom widgets, flex header and footer options, and much more. This hotel site theme is a powerful online booking management system. You can start accepting reservations for your properties online instantly. The theme comes with the easy install feature. So, just one click, you can install the sample data and make your site look like the online demo. This loads your website with default settings, sample content. You’ll just need to input your content, image galleries, set villa or room prices and start accepting online bookings instantly. The ready to use booking engine lets you manage the booking and even accept the payments online. A beautiful hotel booking WordPress theme for for Hotels, Villas, resorts, Rental Houses, or any other rental property. 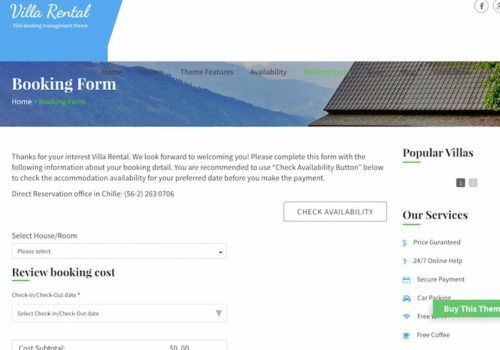 The stylish Chateau WordPress booking theme is your prefect system for managing online bookings. Chateau comes with a powerful booking engine for hotels, holiday apartments or villas, cottages, lodges, guest houses or bed and breakfasts or any other type of rental property. This theme is very easy to setup as it includes our “Easy Install” system. The hotel site template can be used as a single or multiple hotel booking wordpress theme. The system is very simple to use and you can start accepting online booking payments online. Showcase and manage your hotel business online with this hotel booking website template. The 5 Star hotel WordPress theme is an extensive and easy to use online booking management system. The theme provides many powerful tools to create a professional looking website with its fully functional booking engine. This hotel booking template also includes an availability checker calendar. 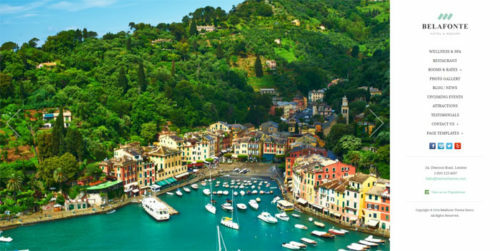 You can use this theme for hotels, motels, hostels, B&B’s, guest houses or for property rentals. Belafonte is a resort & spa hotel WordPress Theme from Hermes Themes. This is an elegant hotel template that has beautiful features to showcase your hotel amenities, scenery, restaurant, spa and more. Wordpress is an easy way to create your website and using Belafonte WordPress Theme allows you to just install and activate the theme. The theme has all features already incorporated which means you don’t need any programming knowledge or to install anything else. All you need to do is add content, upload pictures and customize your hotel website. Features of Belafonte include full screen image slideshow on the front page, a booking reservation form, photo gallery of your hotel rooms, description of what your hotel rooms include, table to display your hotel rooms and rates, easily show upcoming events in the hotel or surrounding area, table to show local attractions, link to your trip advisor page, social media integrated and more. Belafonte is the perfect WordPress Theme to create a site for a hotel, inn, motel, resort & spa, vacation rentals, bed and breakfast and more. Click here to see more features of Belafonte WordPress Theme. Belafonte is a fully responsive theme in which it dynamically adapts to the viewing screen. This is beneficial because lots of your visitors will be viewing your hotel website with their iPhone or tablet device. Your theme will wrap and resize images, navigation, and content to fit whatever device it’s viewed on while not sacrificing font size. You can test the responsive feature by checking out the demo and resizing the window. You will see how cool a responsive theme is. 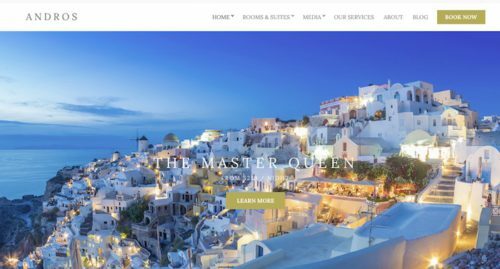 Santorini Resort is a modern, and premium Hotels WordPress Theme. This theme has all the features that are necessary to create a successful hotel website. You can easily use this theme to create a site for a hotel, resort, inn, motel, vacation rental, and any accommodations travel site you need. Main feature of this hotels theme are the online booking module where guests can submit a reservation request by room availability by departure and arrival dates, number of people staying in the room, and type of room required. The booking feature is also directly accessible on the front page where most conversions will happen. Other features include the scrolling feature images is where you can showcase your hotel rooms and showcase your main hotel images. At the top right you can show the local weather and also change the languages for international guests visiting your hotel or resort. You can display each room with their price per night and amenities available for each room in your resort. Click here to see more features of Santorini Resort WordPress Theme. 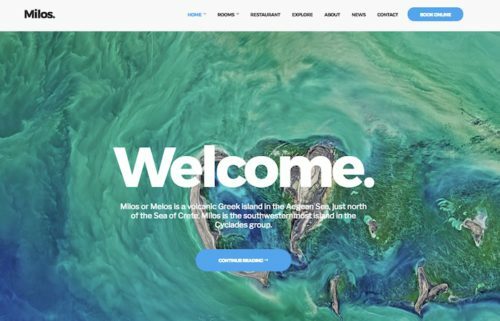 Santorini Resort is a fully responsive theme. Your website content and details will wrap to fit the viewing screen. You can try out the responsive feature by checking out the demo and resizing the window or use your smartphone or tablet to demo Santorini Resort theme. From the demo you can see other features include social media integrated, newsletter, full width image scroller, call to action button, powerful admin panel, easy access navigation buttons and more. 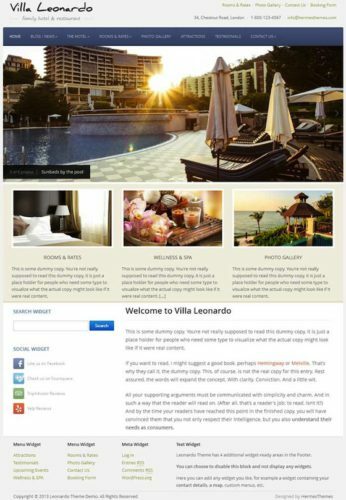 This is a great WordPress theme to create your hotels website. Metropolis, by Hermes Themes, is an elegantly WordPress Theme designed to create a website for hotels, resorts, inns, bed and breakfasts, motels, and any other hospitality business. You can highlight the best features of your hotel with the scrolling featured images, amenities of the hotel, room pictures, hotel photo gallery, room rates, room specs, testimonials, upcoming events at the hotel, list your nearby attractions, online reservations form, hotel contact information and more. You can create your own hotel website easily with no programming knowledge. Wordpress and Metropolis handles all the hard stuff so you can concentrate on customizing and filling in the content of your hotel site. Click here to see more feature of Metropolis Hotel WordPress Theme with Online Reservations. Metropolis is a responsive theme which allows visitors to view your hotel website easily from their tablet or smartphone device. You can test out the responsiveness by playing around with the demo. Start resizing the window smaller and larger and you will see the content automatically wrap to fit the width of the screen. So your site will look beautiful on an iPhone, iPad, Android or any tablet device. Other features of Metropolis include a full width featured content slideshow on homepage, online room reservation system for visitor, forms and testimonial post types, built in form builder, room and attraction page templates, special form for online room booking, photo gallery section, page templates, documentation and more. Below are more features of Metropolis Hotel WordPress Theme with Online Reservations. Cosily WordPress theme is an excellent for hotels, hostels, resort, private villas, holiday homes, holiday apartments or other types of service which requires a booking type system. Cosily will offer a set of amazing features and customization options that will help you make unique and beautiful site. It’s main feature is it’s online booking and reservation feature. Visitors can make hotel bookings first by searching hotel availability by their arrival and departure dates from a date picker, and number of guests. The hotel room search will return a list of rooms with descriptions and a button to allow visitors to choose and book the hotel room now. The following screen will allow visitors to submit their information and submit their hotel reservation. 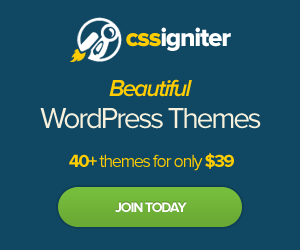 Click here to see more features of Cosily WordPress Theme. Cosily is a responsive theme which means content is always readable on any screen without squinting, zooming into a particular section and endless scrolling to the left and right of your site. Your hotel content is always wrapped to fit the viewing screen whether on an iPhone, Tablet or computer. Other features of Cosily include scrolling featured images, page templates, hotel reservations module, simple booking system, simple page builder to easily customize your site, testimonials page, contact page, shortcode generator, social media integrated, SEO optimized and more.